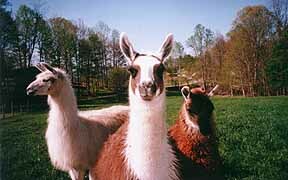 "Hawke", "Dene", "Crazy Horse" and "Scooter"
For over 4000 years Llamas have been used to transport goods across the rugged Andean mountains in South America. Today they are found all across the United States and Canada, carrying loads for backcountry travelers. Hike into a mountain dinning experience with a wooly companion. Our destination is Hidden Falls waterfall! Hawke, Dene, Crazy Horse and Scooter will carry your gourmet meal so you can relax and enjoy nature. You will be accompanied by a knowledgeable guide that will thrill you with culinary delight. Lunch Treks start around 10:30 on Saturdays. Sunset Supper treks start around 5:30 Fridays. Treks on other days may be available by special request. Each trek is about 3 hours long. Cost is $35.00 per person.